All good things come to an end, be it the holidays of trilogies. We're concluding our original Star Wars Trilogy holiday weekend talking about Return of The Jedi with out guests Allison O'Toole (writer, editor), Dave Atkinson (stand-up comic, host of Big Gross Movies), and Joel Buxton (writer, Second City, stand-up comic). 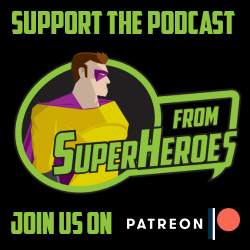 Visit www.TalkFromSuperheroes.com for our episodes about A New Hope and Empire Strikes Back right now.